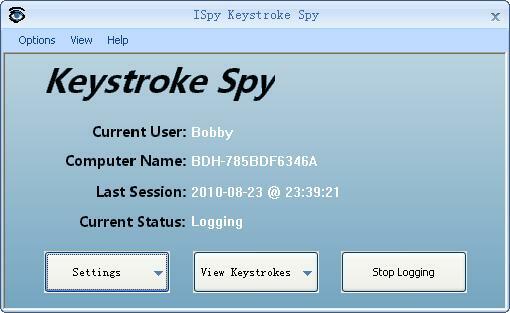 ISpy Keystroke Spy is a powerful tool that can log every keystroke users type and capture screenshots of their activities. ISpy Keystroke Spy can run in total stealth, email you when specific keywords are typed, and can even be set to only log keystrokes typed in specific applications. With ISpy Keystroke Spy you will be able to log keystrokes, emails they send, passwords they use, applications they interact with, typed documents. ...... With ISpy Keystroke Spy you will be able to log keystrokes, emails they send, passwords they use, applications they interact with, typed documents, and see everything they did with visual screenshot playback. Qweas is providing links to ISpy Keystroke Spy 3.0 as a courtesy, and makes no representations regarding ISpy Keystroke Spy or any other applications or any information related thereto. Any questions, complaints or claims regarding this application ISpy Keystroke Spy 3.0 must be directed to the appropriate software vendor. You may click the publisher link of ISpy Keystroke Spy on the top of this page to get more details about the vendor.